Hi, everybody! 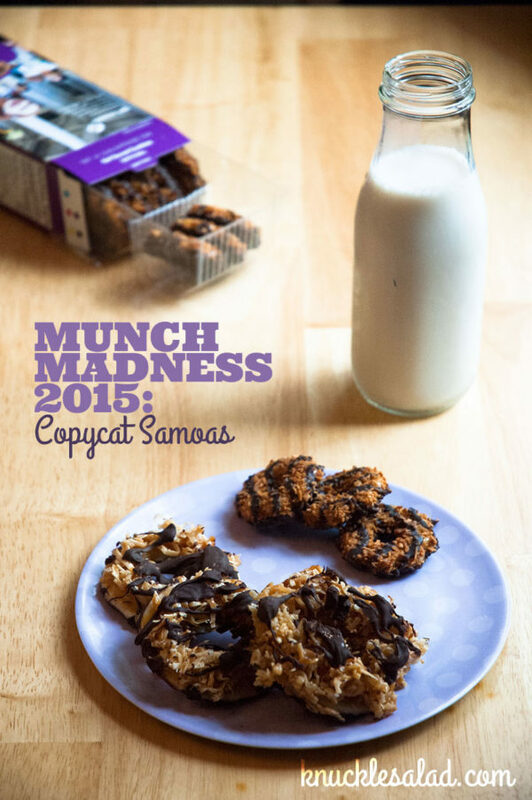 It’s me, Kristina, kicking off Round 1 of Munch Madness 2015: Copycat Edition. First, a quick thanks to the other 18 judges for their stellar reviews. I knew they’d be good—that’s why they were selected—but I am nonetheless gobsmacked by the quality of their contributions, and I hope you all enjoy reading and watching these reviews as much as I have. Happy Munch Madness to us all! 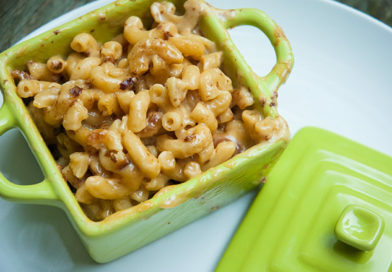 Each of our judges has selected one of the most popular copycat recipes on Pinterest, followed it to the letter, and provided insight into the process, likeness, and quality of each recipe. Some recipes were good but not quite like the original; some were a lot like the original but not very good; some came out of left field; and one was maybe not followed quite to the letter by our judges. 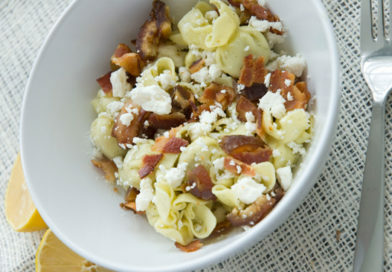 Each judge secretly scored their recipe according to a standardized rubric, and those scores will decide the results of the first elimination round. Use these reviews to guide you in the upcoming rounds, in which you will vote on which you think are the most worthwhile recipes on the bracket. 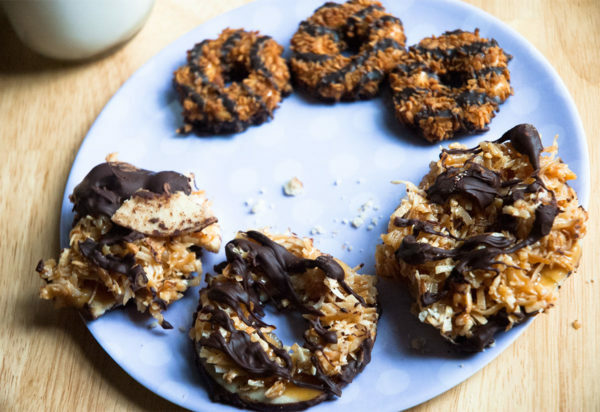 Let’s take a look at copycat Samoas, a recipe that’s been pinned and repinned from Just a Taste. In the list of most-popular copycat recipes, this stood out as the one that everyone was curious about but nobody dared to take on—and quite rightly, for it is a bear. But as the Munch Madness showrunner, my decision to accept it as my own assignment was chiefly rooted in a desire to make sure that none of the other judges, should their recipes turn out poorly, could possibly feel they had been handed the short end of the stick. No matter how they slaved in the kitchen in the name of Munch Madness 2015, they would absolutely not turn around and see me riding high on some kind of Orange Julius cop-out recipe. It wouldn’t be seemly, in my position. 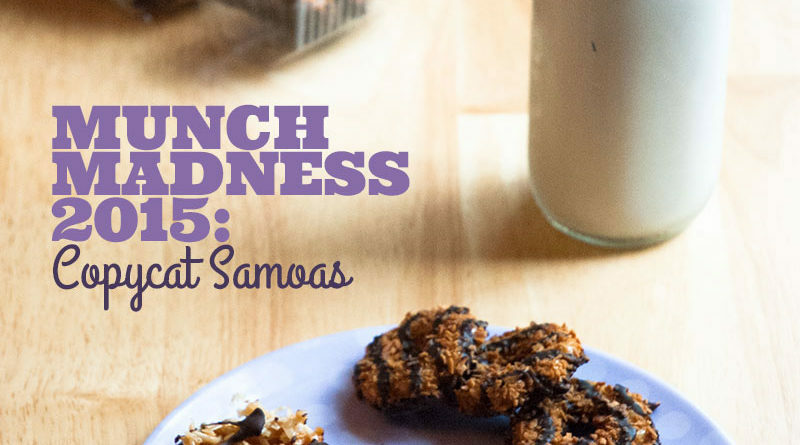 This, however, is likely the last time I will use my recipe choice to prove my commitment to Munch Madness. Spoiler alert: This might also be the last time I bother with a copycat recipe, because frankly, I’ve come to see them as a misguided genre. They’re intentionally suboptimal: they’re meant to emulate a dish that’s correctly prepared by some other method, often involving a factory or MSG, and they replace the factory or the MSG by any means necessary. In this case, instead of spending $5 on little cookies made in an elaborate and efficient cookie factory that was designed for this exact purpose, I spent $11 on chocolate, caramel and coconut, then slaved in the kitchen for about four hours over the course of two days. In the end I had a batch of cookies that were, yes, basically just as good as the $5-a-box cookies (if not altogether similar). But I was too sick of them to care. The recipe on the left looks easier. 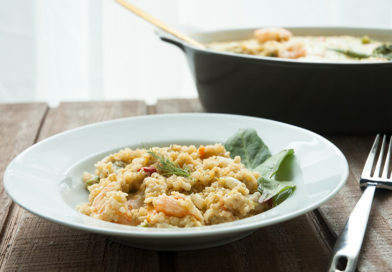 In preparing to make this recipe, I knew I was embarking on a lengthy journey. I’d have to bake shortbread cookies, mix up separate caramel and coconut toppings, top each cookie, then dip and drizzle them all in chocolate. I thought I was prepared for the long road ahead, but each step was more elaborate and annoying than the last. First, the cookies. Easy: cream some butter and sugar, stir together dry ingredients, and gradually combine everything in the mixer. No problem! And the dough was delicious! Of course, then it had to be shaped into two discs, wrapped tightly and chilled in the fridge for at least an hour. I chilled it overnight, because I have other things to do. The next day the dough was hard (you would be too if you’d spent the night in the fridge—wait, I mean—I’m just saying of course it was), so I set it out on the counter for ten minutes as advised, while I steeled myself (and the kitchen) for the infamous tornado that is rolling out cookie dough. But apparently, I did not need to set the dough out for ten minutes as advised. Apparently, that was the wrong thing to do. I put it back in the fridge and took out the other dough-patty and rolled it out cold. It wasn’t much easier, because it was somehow both rock hard and squashy, but at least it didn’t become one with the counter. I cut out the cookies (I ised a 2.5″ circle cutter and a bottle with a 1″ mouth). 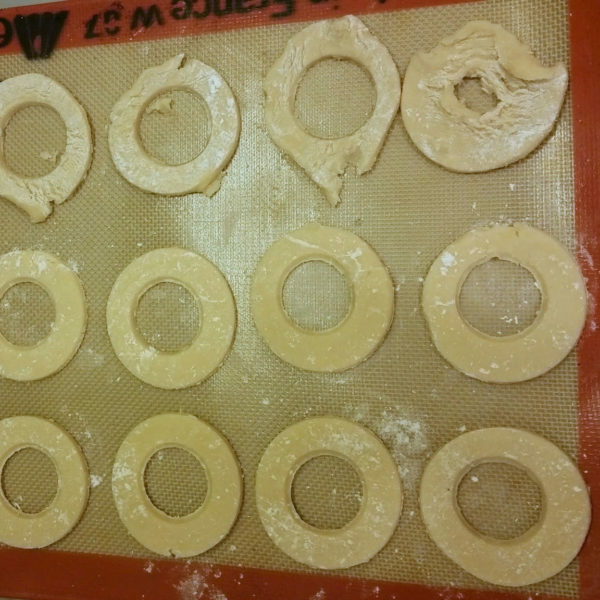 It took about 30 seconds to cut all the circles, by which time the dough had already softened enough that the wet, limp cutouts were difficult to transfer neatly to the cookie sheet but I got them there with just a few finger-dents around the edges. Some of the donut-hole cutouts had gotten so soft that the only sensible thing to do was to eat them right up. Then I rerolled the remaining scraps of dough and tried to cut out more cookies and things started getting stupid again. I started at the bottom-left, and the cookies get dumber and dumber toward the top-right. I decided I would rather they be finished than round, so I got them into the oven (they only take twelve minutes but need to be turned halfway through so you basically have to live your live in six-minute increments). Sadly, the cookies weren’t nearly as tasty as the dough, but I ate two anyway just to make sure. When they had cooled enough to move to a rack, I transferred the silpat to a cold cookie sheet, rolled the re-chilled dough, and continued. It went on like this for three batches. This made 48 cookies, including the two I sampled right out of the oven and a third which I ate raw off the cookie sheet because it was too ugly to bake. 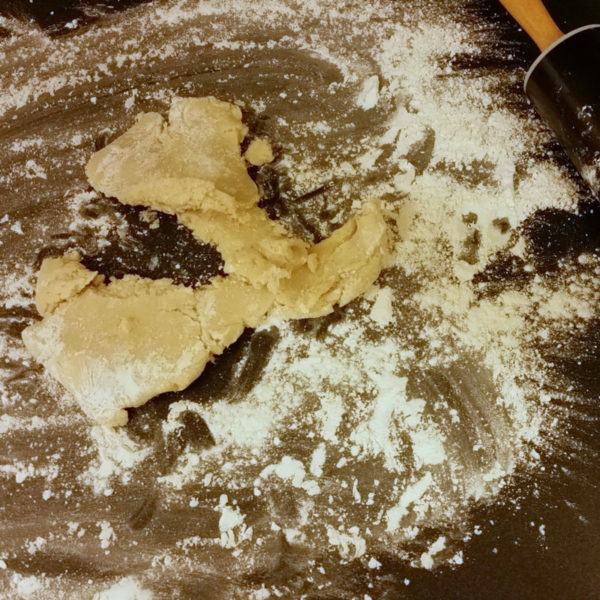 Considering how much dough I had sampled as I worked, I probably could’ve made at least six more cookies—and more still if I’d had the right 2″ diameter cookie cutter instead of 2 1/2″. The recipe was only supposed to make four dozen. Maybe I rolled them too thin. Too bad! The cookies were done. The recipe calls for 15 ounces of caramels. I found an 11oz bag and a 4.51oz bag from two different brands, then counted them out and removed two caramels to bring it down to 15 ounces exactly. None of this was necessary. Then it was time to melt caramels (which had to be individually unwrapped, a distinctly first-world labor but a labor nonetheless) and toast coconut (which fits on a standard cookie sheet at about 3/4″ thickness, so it takes a lot of bake-stir-bake-stir to get good toastiness). Neither the melting nor the toasting was particularly fun, but at least I could do them at the same time, so it only took about 20 sticky minutes. 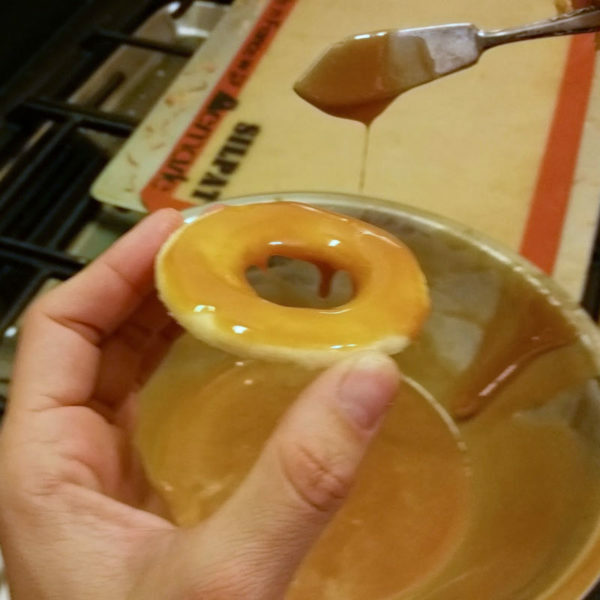 Then the coconut went into a big bowl and “three quarters” of the caramel got poured over it. I have no idea how I was supposed to know if I had put “three quarters” into the bowl. I put a lot and saved a little. That is how I measured that. Because I wasn’t about to pour the whole sticky mess into a measuring cup and then pour out a little at a time and scrape it all down off the sides over and over until only a quarter remained. That is what a crazy person would do. Stirring the caramel into the coconut took some elbow grease but I got it done. And I spaced all my cookies out on aluminum foil (I don’t keep parchment on hand, but I always use foil when I coat things in chocolate and it always works fine) and created a little assembly line for myself and I was ready to go. Now, the recipe implies to me that I should spread the remaining—wait, it says “the remaining 1/4 cup of caramel,” which means I could’ve just measured 1/4 cup to set aside, if I had noticed that the first three times I read it, instead of going by the instruction to “combine 3/4 of the caramel with the toasted coconut” but honestly it’s done now and I don’t care. So anyway, as I was saying, the recipe implies that I should spread all of that reserved caramel over the cookies in one step, and that the next step should be to put the coconut mixture on top of all the cookies. That is not realistic. 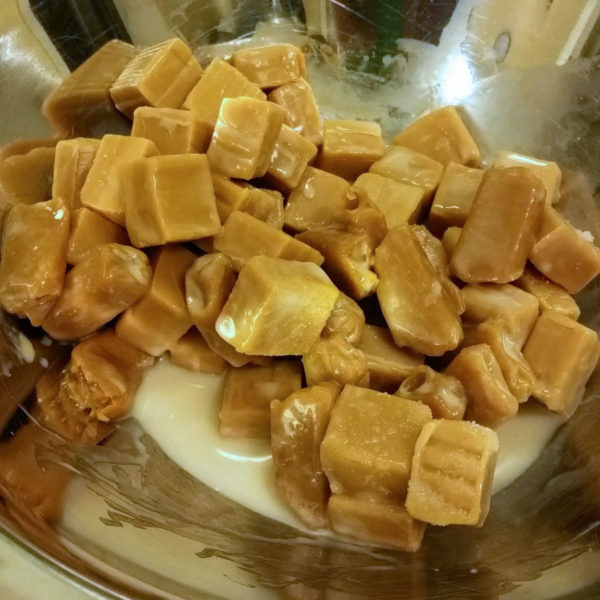 The caramel sets up so quickly that each cookie had little caramel stalactites hanging off of it at the end of the five seconds it took me to spread the caramel on. So I kept the caramel on the stove and did one cookie at a time, lifting the cookie to the caramel bowl, spreading the molten caramel on it while trying (and failing) to miss my fingers, then digging into the scalding hot, sticky coconut-caramel mess and pulling out wads of topping to try to mash onto the top of the cookie before the caramel fully hardened. This was a miserable mess. I was supposed to use way less filling per cookie, and I tried, but it didn’t seem possible. In order to get it on there at all, I had to move it in large clumps, and then make sure the clumps were tall enough to lend each other tensile strength. 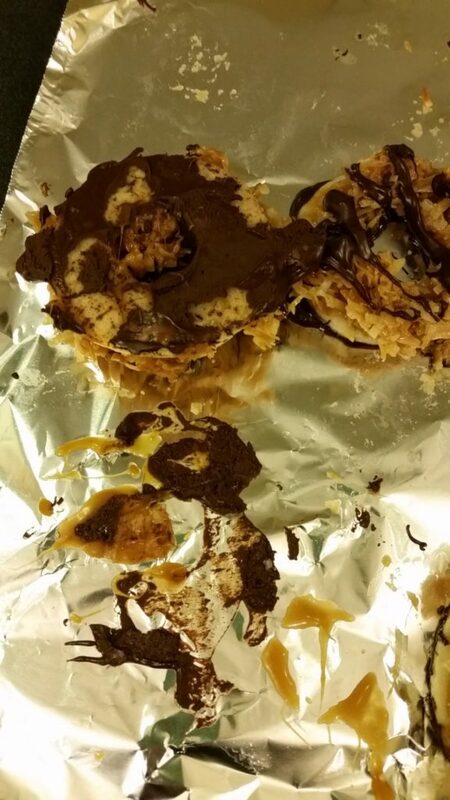 Also, the process of trying to get the coconut to stick to the caramel resulted in three of the cookies buckling. That’s three out of 15, because this part of the process was such a nightmare, and at this point it was getting so late, that I let myself off the hook and decided I only had to finish 15 out of the 45 cookies (because there are 15 Samoas in a box). So I made 12 OK ones and three little piles of broken cookie clinging tragically to the bottom of lopsided coconut haystacks. 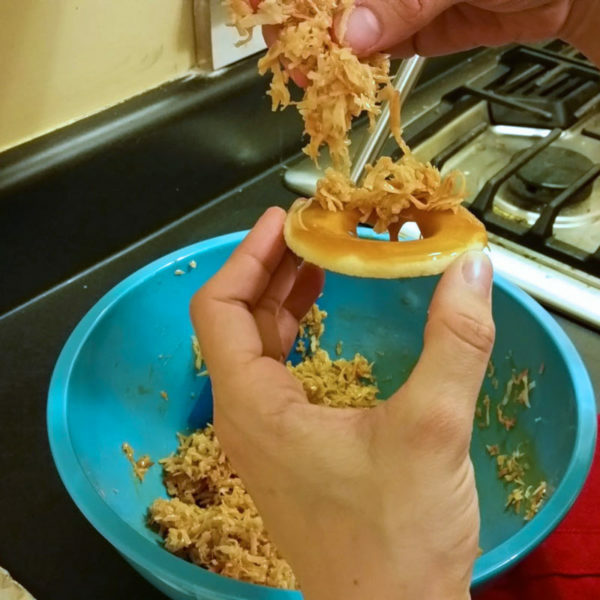 Then, to use up the rest of the stuff, I poured the remaining caramel casually into the centers of the naked cookies and wedged a little wad of coconut onto the top of each. To my surprise, even though I was using far less coconut this way, I was not able to finish the batch of 45. Not even close. Fifteen down, thirty to go. But also screw it. Then the chocolate. Chocolate can be a pain, but compared to everything else, this should’ve been the easy part. And it was. But maybe I bought the wrong brand of chocolate, or maybe my double boiler got too hot, but after everything had set and I went to pick up the cookies to put them away, the chocolate stayed on the foil. Do you see this? Do you? In my many years of coating stuff in chocolate and letting it set on foil, this has literally never happened to me. This recipe is like a curse. Fortunately, I had reached a point well beyond any interest in the finished cookies, so I was not upset or particularly disappointed as I pulled each cookie up off of its limp chocolate coating and set them, naked-bottomed, on a plate in the fridge. I didn’t care anymore. I licked most of the chocolate off the foil and went to bed and the next day I woke up knowing those stupid cookies were in the fridge and I thought, yuck, maybe John will eat them. More like sloppycat Samoas, am I right? Can you spot the original Samoa? John and I agree that the cookies taste fine. 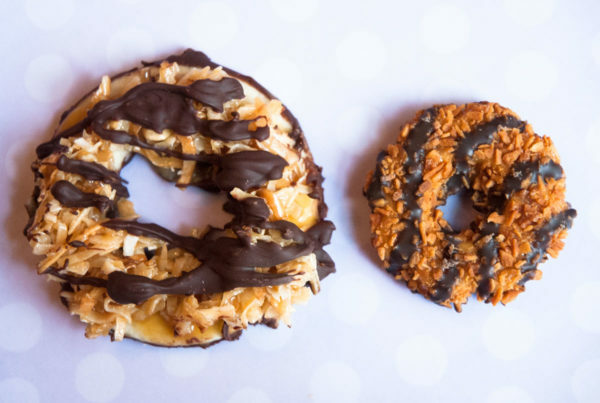 The cookie-coconut-caramel-chocolate ratio doesn’t match up with real Samoas, and a lot of that has to do with the size of the shredded coconut you can buy off the shelf. 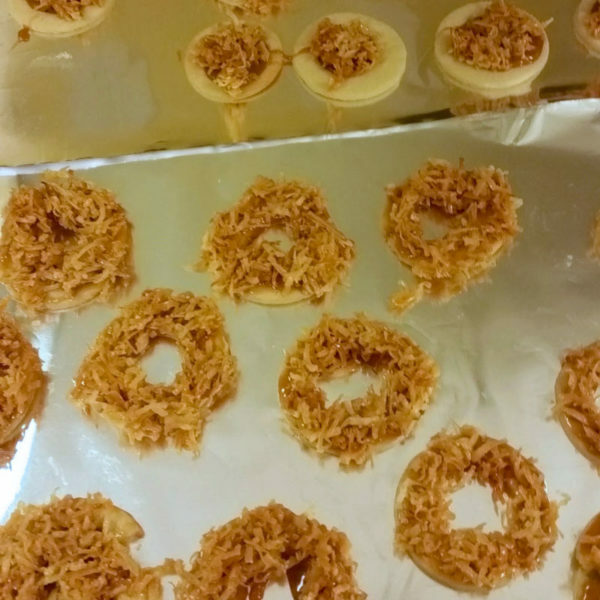 Samoas use far smaller coconut bits and I envy the machine that gets to pile on little coconut shreds and doesn’t have to burn its fingers. But these still taste good. They’re hard to eat, but they taste good. So I can’t fault the recipe for that. Some people find baking relaxing. 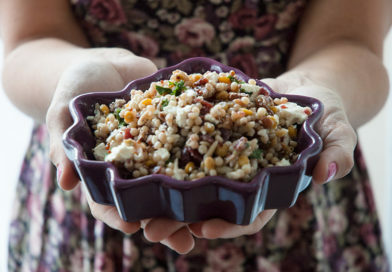 This recipe is involved and labor-intensive and messy. If that’s what you like about baking, then I guess you’d think it was a pretty good time. Like, in the same way that people who like doing jigsaw puzzles would probably enjoy reassembling a demolished building. Alone. So if you just buy the cookies instead of making your own, you’re saving money, somehow. You’re saving hours of your own time—not two hours including the one hour time to chill the dough, as the recipe claims, but four hours or more. Two hours is crazy. 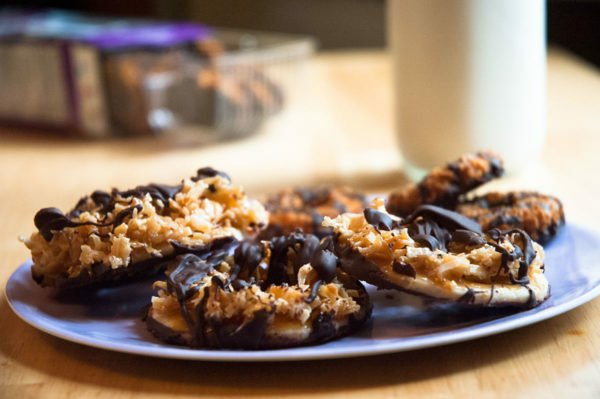 That’d leave you one hour of hands-on time to make dough, roll it out, cut cookies, bake in batches, toast coconut, melt caramel, paint caramel, smush coconut, dip in chocolate, and drizzle. I’m not sure the actual cookie factory that makes actual Samoas can bang them out that fast. And after you save all that time, and all that money, your wee $5 purchase of a box of cookies directly supports the Girl Scouts of America. 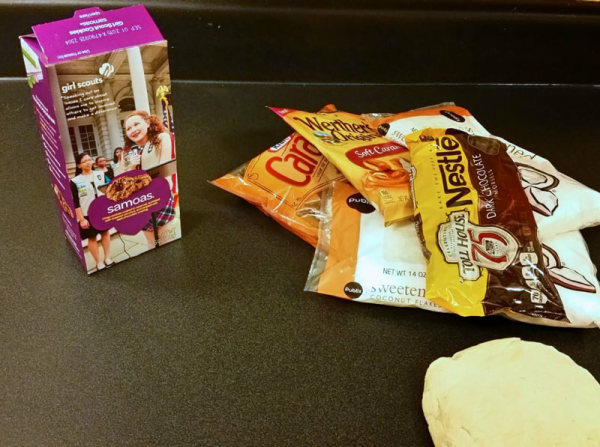 It wouldn’t be crazy to donate $5 to the Girl Scouts and get nothing in return. So if you think of the $5 as a donation, Samoas are free. And they don’t scrape the inside of your mouth all up. What I’m saying is that if I were to make this recipe again, it would have to be because I loved someone very, very dearly, and that person loved Samoas very, very dearly, and it would have to be like October, and this person would have to be actively in the process of dying, and there would have to be no eBay because you can definitely get Girl Scout cookies year-round if you look online so I would rather just order some of last year’s Samoas and spend those four laborious hours with my dying loved one instead. So no. I will probably never, ever, ever make this again. There’s nothing really wrong with the cookies, and the recipe is not a bad recipe. But when I think of what else I could make with $20 in ingredients and four hours of my time, I can only look at these cookies with regret and resentment.